Pictures! We have pictures!! Eureka. There's only one small teeny little problem....I have no clue what I did to get them here. Needless to say the odds of me remembering what I did are slim to none. What combination of "what if - I pushed button q, p, and w - or maybe it was button %,# and & - or maybe it was z,g, and h" am I supposed to retain in my memory banks for future use? Sigh. Technology! Anyhoo...yesterday's picture (altho blurry and terrible in colour) was this year's ornament. Twenty-seven of them, to be exact. Today's picture is fabric which is about to be turned into a couple of aprons. I love the poppies!! I have a picture to show - I know I have a picture to show. I could see it. I even figured out (more or less) how to edit it. I figured out how to save it. BUT NOW I CAN'T FIND THE CURSED THING so I can load it on here!!!!!!!!! I want my old program back.....waaahhhhh!!!! I know there HAS to be a way to edit pictures in this new program but I'm darned if I can find the magic buttons to push...so....I'm sorry about the colour on these.... Above are the new atc's I received in our swap today...the top two are by Irene and the bottom two are by Sue. The 'thing' on the right is what mine were made from. Hopefully if you embiggen the picture it will show better???). Anyhoo...our theme was 'weaving'. Irene painted fabric and cut strips to weave her atc and Sue used curling ribbon to make the Christmas ornament on the left. My weaving was done using a piece of plastic onion bag mesh woven with two colours of wool which I then felted in the washing machine. Unfortanately it felted too well and I only had this little bit left to make an atc for me!! Not to worry though, because it was the technique I wanted to try. Irene is doing the workshop on the web being run by Maggie Grey and the atc on the upper left is one of the techniques from that. I WISH the picture was clearer because the colouring and texture are marvelous!! Fun day...fun friends...and altogether too much chocolate. Perfect day!! Our #2 son was home on the weekend and nicely uploaded a new program for use with my camera. It's another learning curve!! Today's picture is a total experiment and shows my favourite Christmas ornaments (and a picture of my 'babies' who are now 25 & 23 and a WHOLE lot taller than they were here!!). This nativity scene was one I bought from Avon when I was a salesperson for them. It's white procelain and I love it. I don't have all the pieces that were available but I do have the main ones. The lampshade is one I made several years ago when I took a workshop. I have a little bit done on the block for this month but have had a couple of days of very little time spent in the studio. (Picture is clickable). 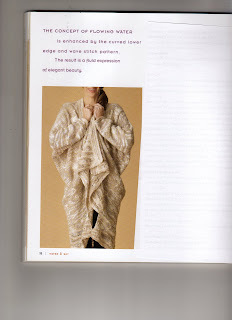 The seam on the upper right and the seam below the girl are both taken from Pam Kellogg's 'Elegant Crazy Quilt Seam Treatments' e-book. The seam to the right of the girl and the seam on the lower right are both from Joan Waldman's 'Quilt Savvy' book. The beaded motif in the middle is from a pattern SharonB posted on her new blog ( http://www.pintangle.com/journal ). I added the beads. To the right of the girl is a backstitch spider web from the 'A-Z Book of Embroidery Stitches 2'. The seam on the lower left is also from the A-Z book (fern stitch). I didn't like what it looked like so I whipped the centre with some heavier thread and added the beads. The safety pins are marking areas where I want to add either buttons or something else that will be done at the end. I'm forgetful and just know I would cover the areas up and not think of the goodies I have planned to put there! Oh yes! - the tatting on the right was a present from my friend Marie. Here you go - a picture of the 'project' I've been working on. Unfortunately my computer is balking (again) and not letting me crop pictures so....I apologize for all the 'stuff' cluttering up the surrounding area. The people this santa is going to are Toronto Maple Leaf fans; they own a boat; and have a chocolate lab. I don't think in this picture you can see the boat, but there is one behind the deer on the right side of the picture. The Maple Leaf is the tree topper and there's another on the back of his cape. Purple was also requested. Did you notice that his coat is crazy quilted? (photos are clickable). This is a closer look at the toy basket he's carrying. I had fun making him and now it's on to making more Christmas presents! I spent the entire day working hard on 'the project' I showed you the beginning of a couple of days ago and I hope I will be able to unveil it tomorrow. It's the last commision I have to complete before Christmas. Then I'll be getting busy working on the rest of the presents I have yet to create. This is the sight that greeted us when we got up yesterday morning and is still there this afternoon. The sun is shining so I was able to get a few pictures. These two trees are at the back of our property (along with several others). I don't like winter, but I can appreciate its beauty! I've updated my sidebar address to reflect the change too. It sounds like Sharon has some fun goodies planned for her new site so be sure to visit!! Just what do you suppose this block of wood is going to become? Actually, I spent the day finishing up the last corpse I have to work on and it will be headed out in the mail on Monday. Of course I can't show you a picture until the big reveal! 1. Doreen of http://doreeng.blogspot.com has posted pictures of her embroidered bears and they are sooooo cute! You need to go & have a look. 2. Sharon Boggon has given us the heads up that she will be changing over her blog to another address ( http://www.pintangle.com ) and will let us know when the switch is complete. I'll let you know as soon as I hear. 3. I noted an announcement about the winter issue being 'up' on http://twistcollective.com. Because I didn't know what Twist Collective was about, I had a quick look and it's about knitting. Looks like there's some patterns there too. You might want to have a look. There, I guess that's enough mumbling for today! Hope to have some work to show tomorrow. I finished the bears today and they are already in their new home. These little guys are 15" tall and come from a pattern by Hemer House Designs - pattern name is 'Tiffany'. I like the lambs wool one the best...there's just something about her personality. Now for a bit of trivia...do you know what a group of teddy bears is called? The title of this post will tell you! Yep, I'm working with fur again and it's all over everything. I am determined I'm finishing these bears this week. One is awaiting her bow and is too shy to to have her picture taken without it. This one is lambs wool, which isn't a whole lot of fun to work with either. For some reason unknown my pointer finger (luckily it isn't my 'rude' one!) has decided to undergo another peel and is quite tender. I suppose I shouldn't even be attempting to sew, but I have too much to do and the finger will have to take the punishment. Of course there's a teeny amount of ouching and gosh darns going around too when I happen to forget and try to use it to push the needle through something!! Knitting content? On THIS blog??? Wow, even I'm impressed because knitting isn't something I often get to mention on here. Today was grocery shopping day (yuck) so nothing got done in the studio. However, the mailbox had this book in it when I got home. There are some really nice patterns in it and I must admit there are three I especially like...the cover picture is 'Komon' and is one of the three. 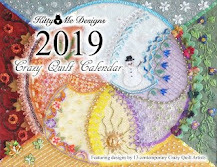 The patterns all look very simple to make because they are mainly constructed with squares and rectangles of knitting. The second pattern I'm in like with is called 'Dogi' and is shown below. 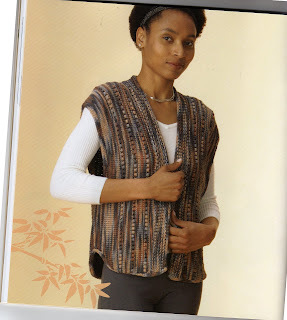 This is a very practical vest and I love that it's knitted side to side. This colourway isn't 'moi', but I sure would like to make it in denim-y tones. 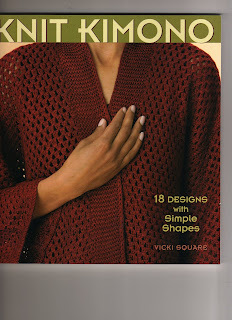 This is the pattern that made me buy the book, but it's the one I will be least likely to make (somehow I envision this one being a lifeswork for my speed of knitting). The pattern is called 'Water & Sky'. I love it though! www.dodgecreations.com is a Canadian site for knitting supplies, yarns, etc. Yesterday we spent the afternoon exploring the wonderful 'Oshawa Fibre Art Show' which is being held at the Centennial Retirement Residence in Oshawa. What a treat for our eyes!! It was all very inspirational and I came home just itching to create something (anything). We weren't allowed to take photos, but if you want to see representations of the works we saw, go to: http://fibreartstudios.com and peek in all the galleries. A few of the pieces in the on-line galleries were actually at the show. Each artist has a different area of expertise and so there was a lot of variety in techniques. Three large rooms filled with pictures, wall hangings and dolls...wonderful dolls. Many of the pieces were for sale. There was also an area where you could purchase small works of art by the artists and I came home with a wonderful fibre art postcard entitled 'Northern Lights' by Anne Marie Desaulniers (who unfortunately doesn't have a blog...yet). I love it! Anyway, if you want your eye candy for the day, please check out the FibreArtStudios website! First, I have never been tagged for a meme or given a blog award - which I am most happy about. I have lived in trepidation that it would ever happen because I really didn't know what I would do about it. I have never been a chain letter participant and, truthfully, I feel memes are much the same. I am also troubled by the numbers of forwarded items I receive in emails which, although quite often interesting and beautiful, are a thinly veiled threat to 'pass them on, or else'. Having said that, there are a few that I feel are worth sharing and I will do so, but with the provision that the recipient not feel obliged to send it on OR to return it to me, thusly cluttering up my inbox even more. (What's with that anyway? Why would I want to have something returned to me that I've already read??). I understand that it would be flattering to be given an award, but I tend to wonder exactly how much meaning there is in it. Are people passing them around just to keep up with the Joneses and because they feel they should? Do they truly, in their hearts, believe the person they're 'awarding' actually deserves said award? To me, if someone likes what I've done or said, a comment on my blog means far more. It's far more personal. Orts or a bird nest?? Recently I was given a margarine tub crammed full of orts..... The lady who gave them to me was rather mystefied as to why on earth I would even want them but is quite willing to save them for me. After Christmas (when time is a little more available) I plan to play around with them and make some useable fabric for backgrounds in art pieces. At least that's what I hope will happen!! Here are three more journal covers I finished on the weekend. These are so much fun to make and don't require a whole lot of investment of time. I'm really up-to-date on my November TIF challenge piece because I actually did put it together on November 1st!! I think this block will nicely balance the other lighter toned block from earlier in the year. 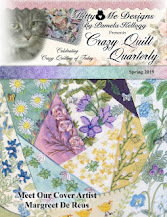 I'm getting really excited to actually start putting the quilt together! !